Good mental health relies on the capacity for adaptation and change. We are like trees: our ability to adapt to the environment depends on roots sunk deep in the soil of personal history, biology, culture and genetics. I am a Board Certified psychiatrist with over twenty years experience in psychopharmacology and psychotherapy. Practicing in a profession that I love, I have formed deep and lasting bonds with my patients. Emotionally and physically healthy people are the foundation of a productive society. When patients’ emotional or physical health is disrupted, they feel as though nothing will be right until their equilibrium is restored. My primary goal is to work with you to promote self-understanding, to create satisfying solutions, and to help you restore your balance and well-being. As a Board Certified psychiatrist, I use a variety of approaches. An initial assessment of each patient helps us develop an understanding of the complex issues at play. I use psychotherapy, if that is a promising approach. As a psychopharmacologist, I may prescribe and manage medication as needed. But I also advocate for alternatives to medications, such as regular exercise and proper nutrition to help you restore vitality, balance, and meaning in your life. My New York City private practice is inclusive: I treat people of every educational, socio-economic, and ethnic background, as well as every sexual orientation. My patients range from late adolescence to old age. I maintain the highest professional standards. I do not meet with pharmaceutical representatives. My clinical decisions are evidence-based and reflect the latest research. If you would like to make an appointment for a consultation or if you have any questions, please phone me at (646) 593-2134 or contact me via email. 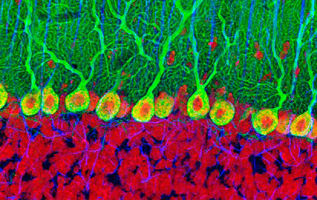 Above: Purkinje neurons (branching cells in the cortex) are among the largest and most complex cells in the brain. Each cell is capable of receiving input from over 200,000 other cells.